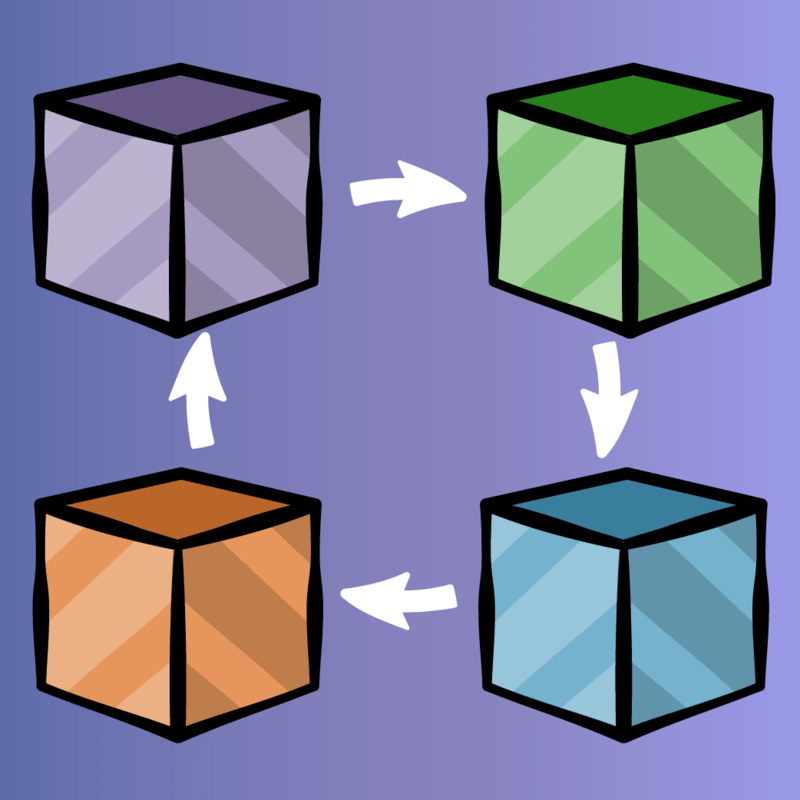 The new prefab workflow is here! 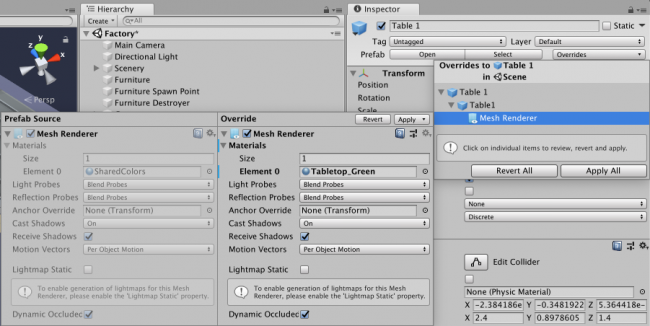 Rejoice and find out how to make the most of prefab overriding, nesting and variants in Unity’s new prefab workflow. 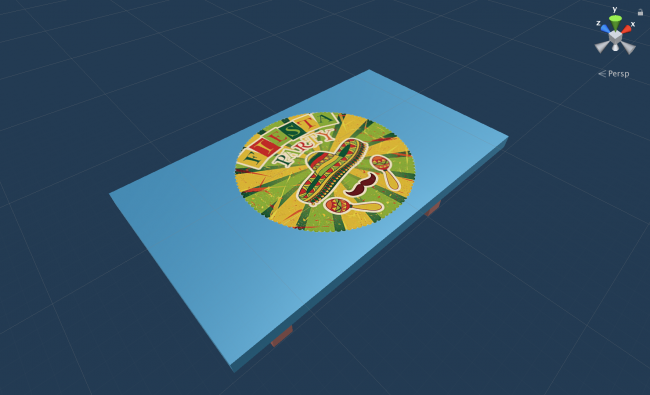 Open the Factory scene in the Assets \ RW \ Scenes \ Factory folder. 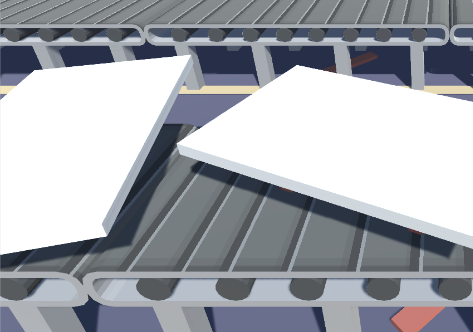 Open the Assets \ RW \ Prefabs \ Furniture \ Pieces \ Chair folder. Notice there are a number of variations for the different pieces that make up a chair. 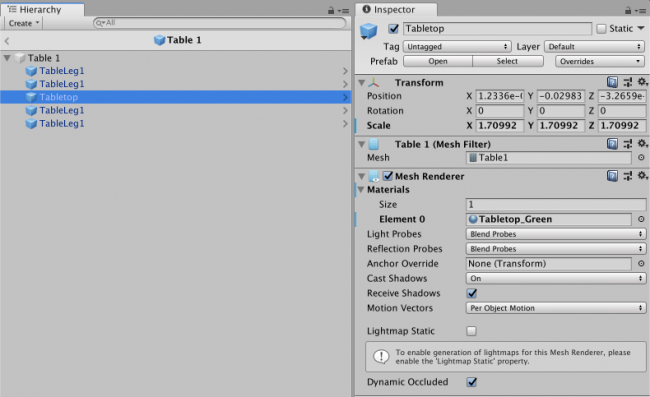 Drag a Table 1 prefab from Assets \ RW \ Prefabs \ Furniture onto the list to add it. 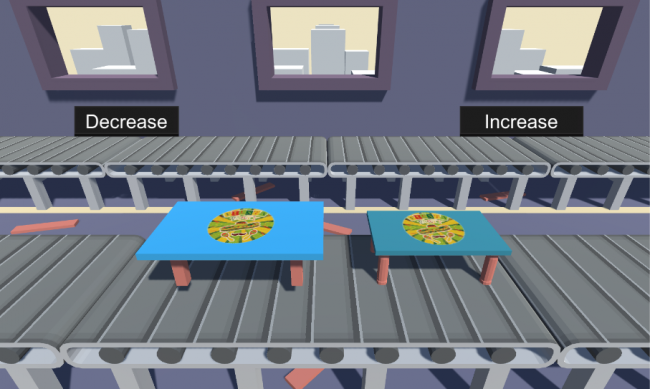 Create an instance of the Table 1 prefab from Assets \ RW \ Prefabs \ Furniture by dragging it from the Project window to the Hierarchy. Click on the arrow next to it to open it in the Prefab editor and toggle the Auto Save option off. Now, navigate to Assets \ RW \ Prefabs \ Furniture, select Table 1 and double-click to open it in prefab mode. Navigate to Assets \ RW \ Prefabs \ Furniture in the Project window and open Table 1 in prefab mode like you did earlier. 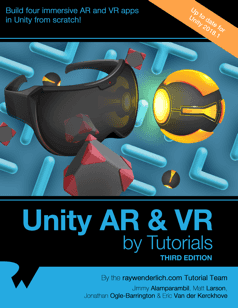 Navigate to Assets \ RW \ Prefabs \ UI. 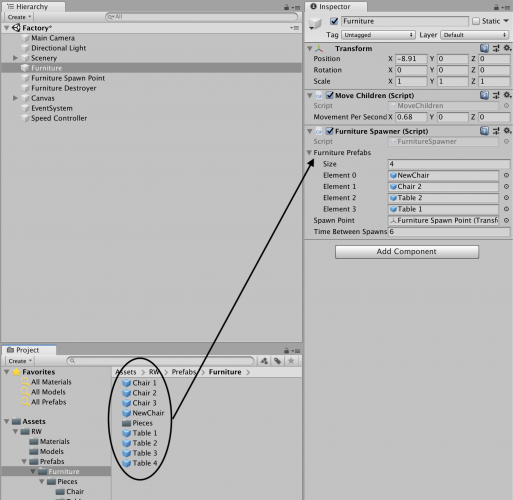 You’ll see that there are IncreaseButton and DecreaseButton prefabs; these are UI buttons that are used in the scene. 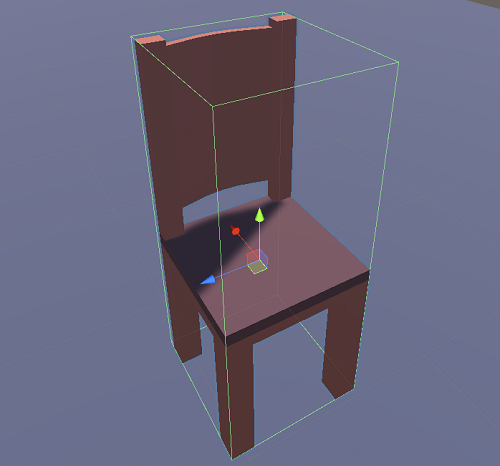 Open IncreaseButton in prefab mode, and drag and drop the Assets \ RW \ Prefabs \ Arrow prefab as a child and change it’s Position to (X:150, Y:0, Z:0). 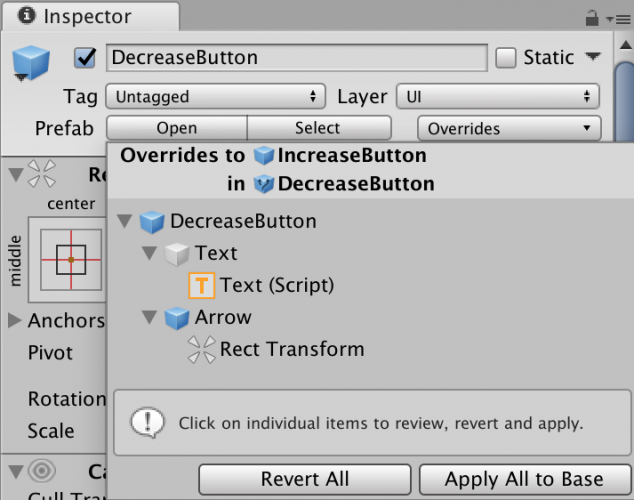 Select DecreaseButton from the Hierarchy, and delete it. 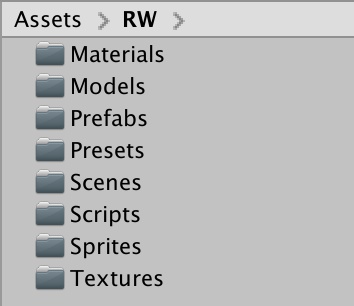 Also, Navigate to Assets \ RW \ Prefabs \ UI and delete the DecreaseButton asset.